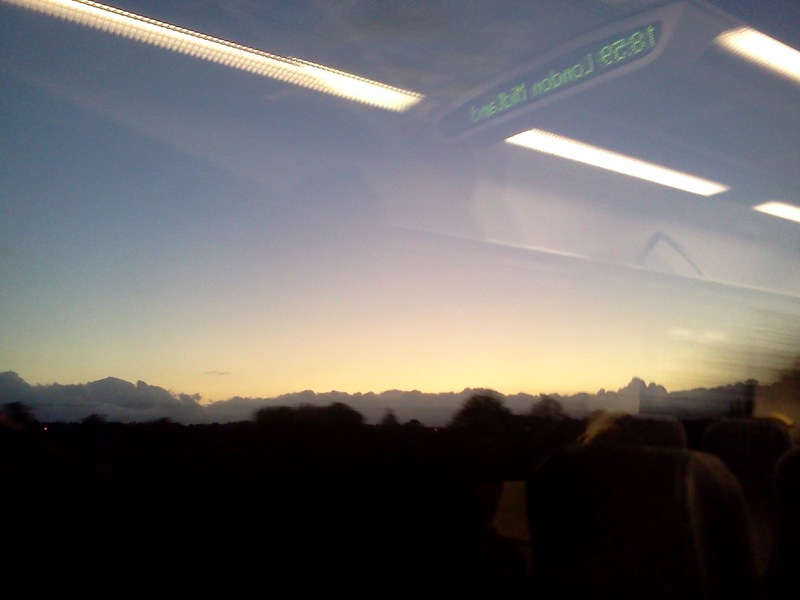 On the whole I like train journeys even if they’re not without their substantial problems. Being tall I find the seats cramped and at a table my legs become intimately and embarrassingly entangled with those of other travellers. There is also the ever rising price and I can never seem to find cheap tickets for any of the routes I want to use. I did find a ticket for a third less, but it would take eleven hours instead of four and require me to spend the night in Birmingham. I assume this isn’t one of the fantastic offers the train operators boast about. The biggest advantage over driving is being able to safely daydream, while staring out at the passing landscape. I always make sure I’m prepared for a longer journey by packing books, music, crossword puzzles, Nintendo DS and anything I think I should be working on, safe in the knowledge that I’ll never use any of them. I’ll take out a book, put on headphones and pretend I’m using them, but really I’m staring out of the window thinking about nothing and everything. Afterwards I can’t recall what I’ve been thinking about. I’m sure I was privately setting the world to rights and found answers to almost every problem, solutions which vanish as soon as the train doors open. Unlike the view from a car, which is a landscape that’s always making concessions for people, the views from a train are less apologetic. There’re no paths, adverts or shops to see. The landscapes are open and clean with no attempt to show you how you might walk or climb to a field, pool or river. It feels like a private scene which you, and only you, own for a moment before it moves on. There are also sights of hidden industrial landscapes. Power station sidings, piles of sand, heaps of rubble, scrap heaps, new rolls of steel cable, garages and vast collections of freight containers. People are not needed, machines move in their own private world along tracks and paths designed only for their ease, movement and dances hidden from us the rest of the time behind shop fronts and shiny finished goods. Human views exist fleetingly and made mostly of your imagination. Sometimes you’re racing along people’s back gardens; sneaking glances at wet abandoned trampolines, cracked glasshouses or immaculate lawns, all for a second. From this you try and construct their whole lives, how many children, what they do for fun, their last holiday destination and what the daily experiences of their lives are. This time the journey went smoothly, my reveres only broken briefly by an undignified rush along a platform between connections at Birmingham New Street. Dodging between oblivious commuters with their ear buds in and minds set only on home. The only natural detail I remember of this journey is a sunset behind slate grey clouds. Following a huge downpour outside Crew the blackness receded, trailing delicate wisps of falling rain. The colours revealed were an impossible combination of orange, blue and purple, in a way ridiculous to describe, and had I not seen them, would have believed impossible to use together without creating a clashing mess.